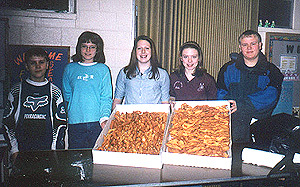 Here some of the teens in the youth group show off their "cheregi" which they made for a fundraiser to help them all attend the first ever Byzantine Youth Conference which was held in June in Uniontown, PA.. Our church had one of the largest groups of teens attending!!!! 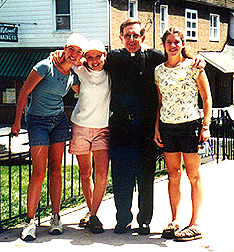 Here Father Dennis poses with some of the young ladies from the youth group. He is very involved with the youth group and has joined them in trips to Cedar Point, white water rafting, and in their meetings. 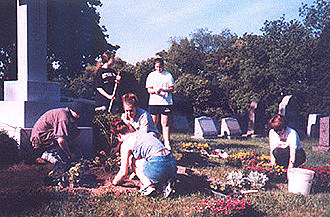 Here the youth group work at the Rose Hill Cemetery in our church's section, cleaning graves and planting flowers. 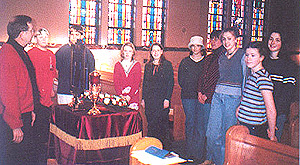 Father Dennis instructs the youth group at one of their meetings in the church.